Fig. 3. Targeted disruption of the mouse heme oxygenase 1 (Hmox-1) gene. Genomic structure and partial restriction map of the mouse Hmox-1 locus (top), the targeting vector (middle), and the predicted structure of the targeted locus (bottom) are shown. Solid and open boxes represent the coding and noncoding regions of the exons, respectively. The hatched box indicates the DNA fragment used as the hybridization probe. E, /xoRI; H, HindiU, N, Notl\ P, Pst\; X, Xhol; Xb, Xbal. The expected sizes of the Pstl genomic fragments from the wild-type and targeted alleles hybridized with the probe are shown at the top and bottom, respectively. The physiological significance of Hmox-1 gene induction during myocardial ischemia remains unknown. It seems reasonable to speculate that Hmox-1 gene induction during ischemia-reperfusion is the heart's own stress signal for survival against oxidative stress. Although a role for Hmox-1 protein in myocardial protection has been speculated, a definitive cardioprotective role for Hmox-1 is missing. To fill this gap, we have developed Hmox-l+'~ mice by targeted disruption of the mouse Hmox-1 gene. The isolated hearts with one functional copy of the Hmox-1 gene and matched wild-type mice are subjected to ischemia-reperfusion. 11 N. Maulik, H. S. Sharma, and D. K. Das, J. Mol. Cell. Cardiol. 28, 1261 (1996). Hearts are homogenized in 50 mM phosphate buffer (pH 7.8) containing 0.1% (v/v) Triton X-100, using a Polytron (Brinkmann, Westbury, NY) homogenizes The homogenates are centrifuged at 20,000g, and stored at -70°. Protein content is determined with an assay kit (Pierce, Rockford, IL). For protein blot analysis, total cellular protein is separated on a sodium dodecyl sulfate (SDS)-12% (w/v) polyacrylamide gel and electrophoretically transferred onto nitrocellulose paper. The protein blot filter paper is incubated in lx Hanks' balanced salt solution (HBBS) plus a 1:2000 dilution of a monoclonal anti-human Hmox-1 antibody (StressGen, Victoria, BC, Canada) for 2 hr. The filter paper is washed with HBSS containing 1% (w/v) nonfat milk, incubated with a 1:3000 dilution of horseradish peroxidase-conjugated goat anti-mouse IgG (Bio-Rad, Hercules, CA) in HBSS plus 5% (w/v) nonfat milk for 1 hr, washed again with HBSS, and then subjected to autoradiography in the presence of an enhanced chemilu-minescent substrate (Pierce). Western blot data are quantified by densitometric scanning. 12 T. Yoshida, N. Maulik, Y.-S. Ho, J. Alam, and D. K. Das, Circulation 103, 1695 (2001). wild-type mice (Fig. 3, bottom). We reasoned that a decrease in expression of Hmox-1 protein due to the targeted mutation in Hmox-l+/~ mice might render the mice more susceptible to increased oxidative stress compared with control mice. Several reports in the literature indicate a role for HSP 70 in mediating cardioprotective effects against myocardial ischemia-reperfusion injury.13'14 The hearts of the animals subjected to heat shock are associated with resistance against ischemic injury. In concert, several HSPs are induced after the heat shock, including HSP 27, HSP 60, HSP 70, and HSP 90. Among the HSPs, HSP 70 is well characterized and has not only been found to play a significant role in ischemia-reperfusion injury, but is also implicated in the reduction of oxidant injury. 13 R. Mestril, S. H. Chi, M. R. Sayen, K. O'Rielly, and W. H. Dillmann, J. Clin. Invest. 93,759 (1994). 14 X. Liu, R. M. Engelman, 1.1. Moraru, J. A. Rousou, J. E. Flack, D. W. Deaton, N. Maulik, and D. K. Das, Circulation 86 (Suppl. 2), 358 (1992). 15 N. Maulik, T. Yoshida, Y. L. Zu, M. Sato, A. Baneijee, and D. K. Das, Am. J. Physiol. 275, H1857 (1998). 16 J. L. Martin, R. Mestril, R. Hilal-Daudem, L. L. Brunton, and W. H. Dillmann, Circulation 96,4343 (1997). 17 W. F. Bluhm, J. L. Martin, R. Mestril, and W. H. Dillmann, Am. J. Physiol. 27, H2243 (1998). 18 F. A. van de Klundert, M. L. Gijsen, R R. van den Ijssel, L. H. Snoeckx, and W. W. de Jong, Eur. J. Cell. Biol. 75, 38 (1998). 19 N. Golenhofen, W. Ness, R. Koob, P. Htun, W. Schaper, and D. Drenckhahn, Am. J. Physiol. 21 A, H1457 (1998). function and reduce infarct size when challenged by an ischemic insult, transgenic mice overexpressing aB-crystallin were generated and characterized. Transgene expression in the mouse heart has been reported with a variety of enhancer-promoter constructs upstream of a cDNA to be overexpressed. 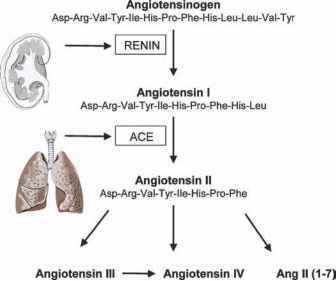 Naturally these enhancers and promoters were derived from genes that are functionally expressed in the heart such as the genes encoding myosins and troponins. For example, the mouse myosin heavy chain a promoter has been extensively characterized,20 and the mouse myosin light chain 2v promoter has been studied.21 In most cases these promoters are subject to substantial regulation by pathophysiological changes in heart function or are specific for certain compartments of the heart. But it is often the intent to explore the effect of overexpressing a cDNA in the whole heart during a pathophysiological state, and therefore it is desirable to construct a transgene whose expression is largely independent of changes in heart function. The human cytomegalovirus (CMV) enhancer coupled to the chicken /J-actin promoter is a strong driver in all compartments of the heart and is largely independent in its expression during pathophysiological changes in heart function. This hybrid promoter, which we chose to use for overexpression of the aB-crystallin and inducible HSP 70 genes, was originally described by Niwa et al.22 and is composed of a human CMV enhancer linked to a chicken /3-actin promoter containing an intron, followed by a rabbit ,6-globin 3' flanking sequence downstream of the cDNA insertion point (Fig. 4). The cDNA for the rat aB-crystallin gene has been described23 and was available to us in a plasmid from which we could derive the coding region by digestion with Xbal and Nod. To this fragment are ligated EcoR\-Xba\ and Notl-EcoRl converters (sequences 5'-AATTCGATCTCGAT-3' and 5'-GGCCGCATATTATG-3', respectively, in the upper coding strand) and both are annealed to complementary oligonucleotides to generate a 5' £coRI site and 3' Xbal site or a 5' Notl site and 3' EcoRl site, respectively. The aB-crystallin cDNA fragment modified in this way can be ligated to the £coRI-digested plasmid pCAGGS, which contains the human cytomegalovirus enhancer-chicken /3-actin promoter upstream of the insertion point of the cDNA (Fig. 4, left). The transgene construct is then digested with Sail and fig/I I to yield a linear fragment that contains the enhancer-promoter followed by an intron upstream of the aB-crystallin cDNA containing its own polyadenylation signal. 20 H. Rindt, A. Subramaniam, and J. Robbins, Transgenic Res. 4, 397 (1995). 21 S. A. Henderson, M. Spencer, A. Sen, C. Kumar, M. A. Siddiqui, and K. R. Chien, J. Biol. Chem. 22 H. Niwa, K. Yamamura, and J. Miyazaki, Gene 108,193 (1991). 23 A. Iwaki, T. Iwaki, J. E. Goldman, and R. K. Liem, J. Biol. Chem. 265, 22197 (1990). Fig. 4. 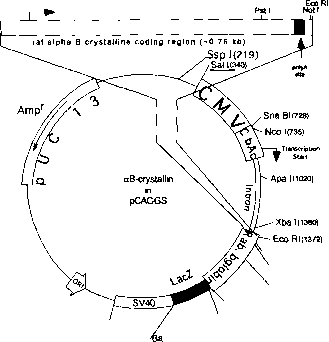 Left: Map of the plasmid construct from which the rat aB-crystallin transgene was derived. It consists of the CAGGS enhancer-promoter (human cytomegalovirus enhancer (CMV), chicken ,6-actin promoter (CbAc)) and aB-crystallin cDNA followed by a rabbit fi-globin (Rab. bglobin) polyadenylation signal. The unique Sal I and Bgl II sites with which the plasmid was cut to purify the transgene fragment for oocyte injection are underlined. 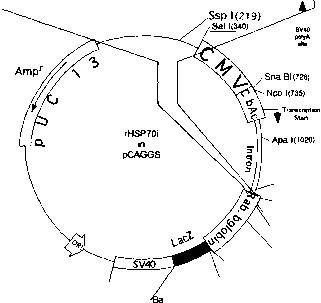 Right: Map of the plasmid construct from which the inducible rat heat shock protein70 transgene (rHSP70i) was derived. It consists of the CAGGS enhancer-promoter and the rHSP70i cDNA followed by a SV40 polyadenylation signal. The unique Sal I and Sac I sites with which the plasmid was cut to purify the transgene fragment for oocyte injection are underlined.